Epirus (/ɪˈpaɪrəs/; Northwest Greek: Ἄπειρος, Ápeiros; Attic: Ἤπειρος, Ḗpeiros) was an ancient Greek state, located in the geographical region of Epirus in the western Balkans. 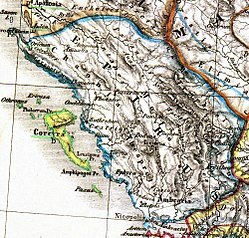 The homeland of the ancient Epirotes was bordered by the Aetolian League to the south, Thessaly and Macedonia to the east, and Illyrian tribes to the north. For a brief period (280–275 BC), the Epirote king Pyrrhus managed to make Epirus the most powerful state in the Greek world, and his armies marched against Rome during an unsuccessful campaign in Italy. The Dorians invaded Greece from Epirus and Macedonia at the end of the 2nd millennium BC (circa 1100–1000 BC), though the reasons for their migration are obscure. The region's original inhabitants were driven southward into the Greek mainland by the invasion and by the early 1st millennium BC three principal clusters of Greek-speaking tribes emerged in Epirus. These were the Chaonians of northwestern Epirus, the Molossians in the center, and the Thesprotians in the south. The Molossian Aeacidae dynasty managed to create the first centralized state in Epirus from about 370 BC onwards, expanding their power at the expense of rival tribes. The Aeacids allied themselves with the increasingly powerful kingdom of Macedon, in part against the common threat of Illyrian raids, and in 359 BC the Molossian princess Olympias, niece of Arybbas of Epirus, married King Philip II of Macedon (r. 359–336 BC). She was to become the mother of Alexander the Great. On the death of Arybbas, Alexander the Molossian, uncle of Alexander the Great of Macedon, succeeded to the throne with the title King of Epirus. In 334 BC, the time Alexander the Great crossed into Asia, Alexander I the Molossian led an expedition in southern Italy in support of the Greek cities of Magna Graecia against the nearby Italian tribes and the emerging Roman Republic. After some successes on the battlefield, he was defeated by a coalition of Italic tribes at the Battle of Pandosia in 331 BC. Campaigns of Pyrrhus of Epirus in Italy. In 330 BC, upon Alexander the Molossian's death, the term "Epirus" appears as a single political unit in the ancient Greek records for the first time, under the leadership of the Molossian dynasty. Subsequently, the coinages of the three major Epirote tribal groups came to an end, and a new coinage was issued with the legend Epirotes. After Alexander's I death, Aeacides of Epirus, who succeeded him, espoused the cause of Olympias against Cassander, but was dethroned in 313 BC. Aeacides's son Pyrrhus came to the throne in 295 BC. Pyrrhus, being a skillful general, was encouraged to aid the Greeks of Tarentum and decided to initiate a major offensive in the Italian peninsula and Sicily. Due to its superior martial abilities, the Epirote army defeated the Romans in the Battle of Heraclea (280 BC). Subsequently, Pyrrhus's forces nearly reached the outskirts of Rome, but had to retreat to avoid an unequal conflict with a more numerous Roman army. The following year, Pyrrhus invaded Apulia (279 BC) and the two armies met in the Battle of Asculum where the Epirotes won the original Pyrrhic victory, at a high cost. In 277 BC, Pyrrhus captured the Carthaginian fortress in Eryx, Sicily. This prompted the rest of the Carthaginian-controlled cities to defect to Pyrrhus. Meanwhile, he had begun to display despotic behavior towards the Sicilian Greeks and soon Sicilian opinion became inflamed against him. Though he defeated the Carthaginians in battle, he was forced to abandon Sicily. Pyrrhus's Italian campaign came to an end following the inconclusive Battle of Beneventum (275 BC). Having lost the vast majority of his army, he decided to return to Epirus, which finally resulted in the loss of all his Italian holdings. Because of his costly victories, the term "Pyrrhic victory" is often used for a victory with devastating cost to the victor. In 233 BC, the last surviving member of the Aeacid royal house, Deidamia, was murdered. Her death brought the Epirote royal family to an abrupt extinction and a federal republic was set up, though with diminished territory, since western Acarnania had asserted its independence, and the Aetolians seized Ambracia, Amphilochia, and the remaining land north of the Ambracian Gulf. The new Epirote capital was therefore established at Phoenice, the political center of the Chaonians. The reasons for the swift fall of the Aeacid dynasty were probably complex. Aetolian pressure must have played a part, and the alliance with Macedonia may have been unpopular; in addition, there were perhaps social tensions. However, Epirus remained a substantial power, unified under the auspices of the Epirote League as a federal state with its own parliament (or synedrion). In the following years, Epirus faced the growing threat of the expansionist Roman Republic, which fought a series of wars with Macedonia. The League remained neutral in the first two Macedonian Wars but split in the Third Macedonian War (171–168 BC), with the Molossians siding with the Macedonians and the Chaonians and Thesprotians siding with Rome. The outcome was disastrous for Epirus; Molossia fell to Rome in 167 BC and 150,000 of its inhabitants were enslaved. Political structure of the ancient Greek world (8th–5th centuries BC). In antiquity, Epirus was settled by the same nomadic Hellenic tribes that went on to settle the rest of Greece. Unlike most other Greeks of the time, who lived in or around city-states such as Athens or Sparta, the Epirotes lived in small villages and their way of life was foreign to that of polis of southern Greeks. Their region lay on the edge of the Greek world and was far from peaceful; for many centuries, it remained a frontier area contested with the Illyrian peoples of the Adriatic coast and interior. However, Epirus had a far greater religious significance than might have been expected given its geographical remoteness, due to the presence of the shrine and oracle at Dodona – regarded as second only to the more famous oracle at Delphi. The Epirotes were speakers of an epichoric Northwest Greek dialect, different from the Dorian of the Greek colonies on the Ionian islands, and bearers of mostly Greek names, as evidenced by epigraphy. They seem to have been regarded with some disdain by some classical Greek writers. The 5th century BC Athenian historian Thucydides describes them as "barbarians" in his History of the Peloponnesian War, as does Strabo in his Geography. Other writers, such as Dionysius of Halicarnassus, Pausanias, and Eutropius, describe them as Greeks. Simon Hornblower interprets the vague, and sometimes even antithetical, comments of Thucydides on the Epirotes as implying that they were neither completely "barbarian" nor completely Greek, but akin to the latter. Nicholas Hammond opines that the principal social structure of the Epirotes was the tribe and that they spoke a West-Greek dialect. ^ a b c d "Epirus". Encyclopædia Britannica. Encyclopædia Britannica, Inc. Retrieved 16 November 2013. ^ McHenry 2003, p. 527: "Epirus itself remained culturally backward during this time, but Mycenean remains have been found at two religious shrines of great antiquity in the region: the Oracle of the Dead on the Acheron River, familiar to the heroes of Homer's Odyssey." ^ Roisman & Worthington 2010, Chapter 1: Edward M. Anson, "Why Study Ancient Macedonia and What this Companion is About", p. 5. ^ Walbank 1989, pp. 462–479. ^ Walbank 1989, pp. 477–480. ^ Walbank 1989, p. 468. ^ a b Walbank 1984, p. 452. ^ Hammond 1998: "Epirus was a land of milk and animal products...The social unit was a small tribe, consisting of several nomadic or semi-nomadic groups, and these tribes, of which more than seventy names are known, coalesced into large tribal coalitions, three in number: Thesprotians, Molossians and Chaonians...We know from the discovery of inscriptions that these tribes were speaking the Greek language (in a West-Greek dialect)." Boardman, John; Hammond, Nicholas Geoffrey Lemprière (1982) . The Cambridge Ancient History, Volume 3, Part 3: The Expansion of the Greek World, Eighth to Sixth Centuries B.C. Cambridge, UK: Cambridge University Press. ISBN 0-521-23447-6. McHenry, Robert (2003). The New Encyclopædia Britannica (15th ed.). Chicago, IL: Encyclopædia Britannica, Inc. ISBN 978-0-85-229961-6.